Virazon II has a tonnage of 170 m3 and has a cruising speed of 10 knots, thanks to twin 425 HP engines. The main cabin on the lower deck accommodates 16 bunk beds with two full bathrooms, and there is also a two-person VIP cabin with an en-suite bathroom and shower. The captain’s cabin is adjacent to the wheelhouse and multi-station offices next to the galley on the main deck. The ship also has attachments for side-scan and bottom-scan sonar, which will assist INA researchers during shipwreck surveys. Virazon II is housed in Didim D-Marin. On 16 May 1979, Virazon was officially transferred back to INA. Her berths were remodeled by Oxford University student Mensun Bound and she was outfitted with a double-lock recompression chamber. A darkroom was put in place of one of the bathrooms and an eight-foot drafting table was installed on top of the recompression chamber. Jay Rosloff spent very hot days overhauling everything in the engine room. All necessary diving compressors and equipment were installed, she was repainted, and a deeper keel was added to reduce much of the roll that was common on open water, thus transforming her into a formidable research vessel that would allow annual coastal surveys and excavations. She was immediately returned to archaeological service for the last season of excavation at Serçe Limanı. 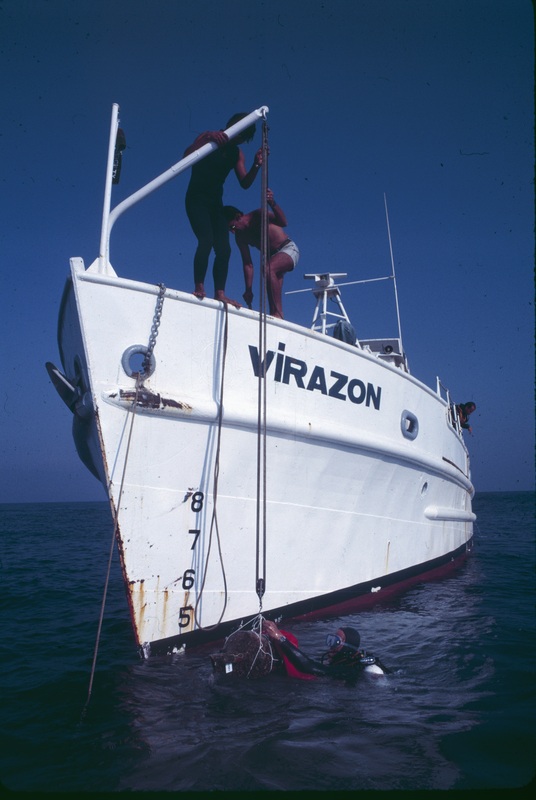 Successful surveys from aboard Virazon were conducted in 1981 and 1982, including an exploratory dive to the 14th-century B.C. shipwreck at Uluburun. A more formal survey took place in 1983 and full-scale excavation began in 1984. 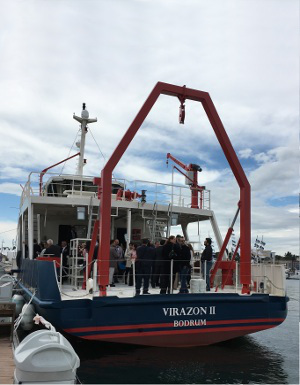 Since that time, Virazon has been utilized on excavations at Bozburun, Pabuç Burnu, Tektaş Burnu, Kızılburun, as well as the return to Cape Gelidonya for the 50th-anniversary excavation in 2010. 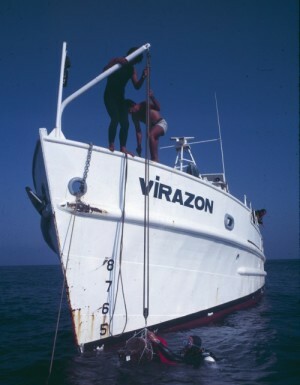 Since being retired by INA, Virazon has served as a dive boat for Barakuda Diving School in Bodrum. Carolyn is essentially a large acrylic sphere attached to pontoons. She is 15 feet long and 8 feet wide and can be transported upon a ramp located between Millawanda’s two pontoons near the stern. When she is ready for use, the pilot and passenger enter the submersible, which is then lowered into the water on the end of the ramp by means of overhead cables connected to Millawanda’s deck winch. Carolyn is retrieved at the end of each dive by reversing the procedure. 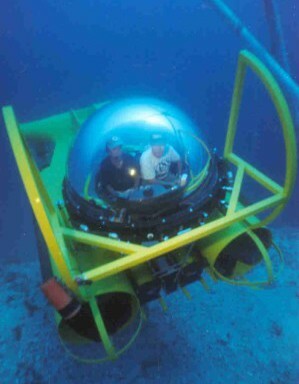 Thus, occupants never need to enter or exit the submersible while it is afloat, although they could do so if necessary. A wireless communications system allows contact between those in the submersible and those on the catamaran. When a wreck or possible wreck is located, the submersible’s occupants call for divers on Millawanda to descend along the buoy line in order to examine the site more closely. For added safety, Carolyn is purposefully buoyant. If there is a loss of power, the SEAmobile floats safely to the surface. 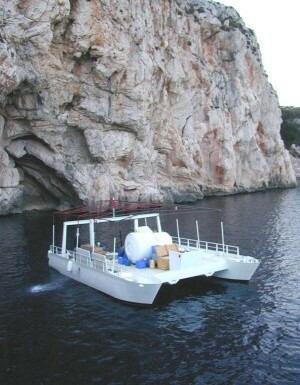 Other safety features include inflatable soft tanks to increase buoyancy should a battery pod flood, a weight release mechanism for the same purpose, and a closed-circuit re-breathing system that filters carbon dioxide out of the air while replacing it with new oxygen for up to 72 hours. Additionally, she has a four-ton winch used to raise and lower the submersible and other heavy objects from the sea. Millawanda was sold in February 2014, and has since been in service in Yalıkavak.